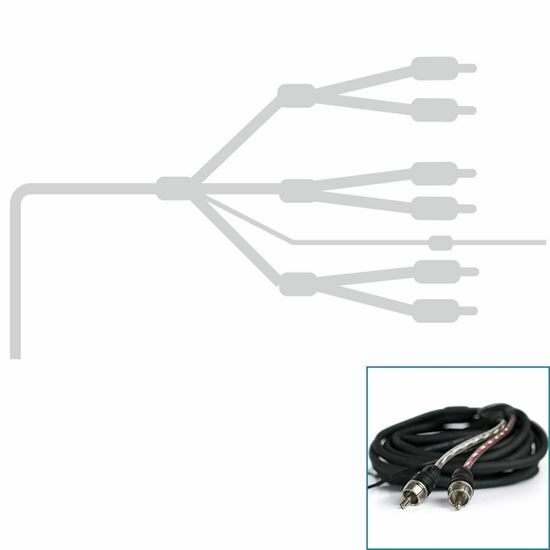 2-4-6 CHANNELS available. SOFT TOUCH™, matt black jacket makes for an extremely flexible cable. 2-4-6 CHANNELS available. SOFT TOUCH™, matt black jacket makes for an extremely flexible cable. POLYAMIDE POLYMER inner jacket protects inner conductors. 110% TWISTED MYLAR AND DOUBLE ALUMINIUM shield rejects RFI and EMI. WTPTM (Winding Twisted Pair) balanced conductors reject low frequency electro-magnetic fields. CDASTM (Cascaded Dual Aluminium Shield) to eliminate radiated interference and ensure “noise-free” signal transfer. OVER 100 dB noise rejection. PLATINUM SATIN ABSTM style machined metal contacts. EXTENDED REMOTE TURN ON WIRE, built-in remote conductor for ease of installation. TUG-PROOF sealed internal connection for maximum reliability. MOLDED Y BLOCK for protection of the conductors in critical split point. “COMPETITION GRADE” performance.